I’ve just got back from a visit to Greece to speak at a conference on my book, Marx 200. While I was there I talked to several left activists and academics and it seems that little has improved for the Greek people since my last visit two years ago. Back in 2010, Greece started to sink fast under the Aegean, hitting the bottom in 2015. But since then, the economy has remained stuck in the mud and hardly moved. In my book, The Long Depression I characterised the difference between a ‘normal’ slump in capitalist production and a depression. The slump takes the form of a V in investment and output, down and then back up. But a depression is more like a square root: down, then a small recovery but not to the previous level but staying trending below. The Greek economy since the beginning of its crisis in 2010 fits that perfectly. Greece’s economy grew 1.4% last year, marking the first time that real GDP growth has exceeded 1% since 2007. But national output is still down 22% from its peak, “an output collapse unprecedented in the annals of modern Europe and one that rivals the severity of the Great Depression in the United States” while average real living standards (real wages, pensions, social welfare) are down 40% from the peak. Unemployment remains over 20% and youth unemployment is closer to 40%. More than 600,000 working age Greeks have left the country seeking work. And Greek capital remains prostrate. Gross investment as a share of GDP is about half of its pre-crisis value. Moreover, part of gross investment is the replacement of depreciating capital – such as replacing worn-out machines, or renovating decaying hotels. Net investment (i.e. 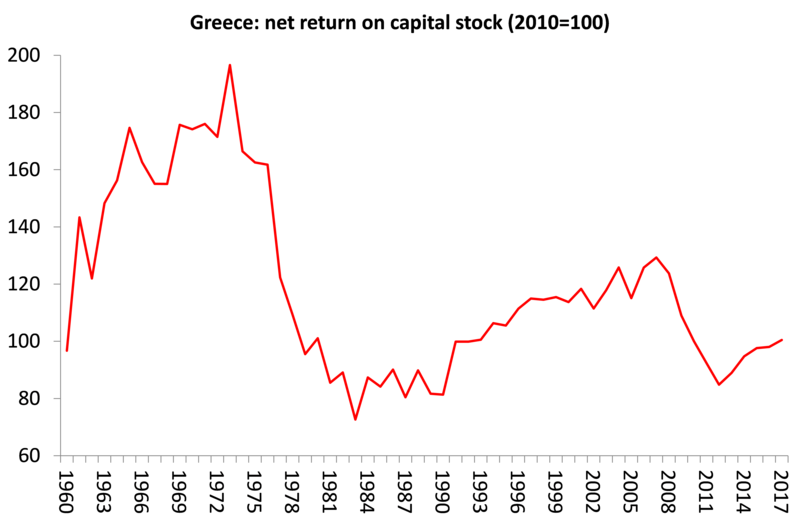 gross investment, minus depreciation) was about 10% of GDP before the crisis, indicating that the capital stock was increasing at that time. But net investment has fallen absolutely since 2010, so the effective capital stock of the country is decaying. Investment by the Greek private sector is constrained by low corporate profits (limiting its own funds available for investment) and weak bank balance sheet positions, as reflected by the approximately 40% share of total loans made by Greek banks that are non-performing loans (which constrains available bank lending). Indeed, although the profitability of Greek capital has finally recovered a little, based on the liquidation of the weak and smaller businesses, huge unemployment and a reduction in real wages, the rate of profit is still below the level of 2010. And small businesses and workers also face the huge burden of sharply increased taxes. This is to meet the fiscal targets set by the Troika (the ECB, the IMF and the Eurogroup) imposed in a series of ‘bailout’ programmes introduced since 2010. Greek public debt was about 80% of GDP in 2010 as the tsunami generated by the global financial crash and the Great Recession reached weak Greek capitalism. That public debt is now around 180% of GDP. Why? Because the German and French banks demanded full face value repayment of the Greek government and bank bonds that they had bought before 2010 when interest yield was so high. But Greek banks could no longer service these bonds because Greek capitalists were going bust or defaulting on their bank loans. The Greek state was also unable to bail out its banks and meet its bond obligations as the economy collapsed. The rising cost of unemployment and welfare and falling tax revenues drove up the government budget deficit to record levels. Austerity was now the order of the day. Workers, as taxpayers, had to take on the burden of servicing and repaying the capitalist sector’s debt. First, Greek conservative governments agreed with the Troika on a series of cuts in public sector jobs and services, privatisations and pension reductions to ‘stabilise’ the debt. But despite the sacrifices, successive bailout programs failed to restore the economy. So more loans from the official agencies were conjured up, along with yet more austerity. Then the leftist Syriza party won the election in 2015 pledged to oppose any further austerity and called for debt repudiation. And as we know, in July 2015 the Greek people voted 60-40 to reject the Troika measures. But within days of that referendum, the Syriza government capitulated to the pressure of capital as the ECB withdrew credit and support for Greek banks and the banks were closed. Syriza signed up for a new program that took the debt up to its current 180% of GDP. That program comes to an end in August this year and in the next few days the Eurogroup and the Syriza government must decide what to do next. But, as a recent report by some top mainstream economists, put it: “A spectre continues to haunt Greece and no less its creditors. Under plausible projections for growth, interest rates and fiscal performance, the government’s debt is unsustainable, as its official creditors have effectively acknowledged.” Despite never-ending ‘austerity’ in the form of annual budget surpluses, the debt level has remained undisturbed – because as fast as the government cuts spending, the loans keep rising – but not to fund government services but to repay previous loans to the IMF and the ECB! The Syriza government has done everything asked of it by the Troika and now, with just a maximum of a year to go before new elections, it is desperate to get the Eurogroup to agree to some ‘debt relief’ to convince voters that things are finally going to improve. The IMF agrees that debt relief is needed, along with a less severe trajectory for further austerity. But the Eurogroup does not. It refuses, so far, to reduce further the interest rate on its loans (already pretty low) or extend the time scale of the maturity of the debt repayments (already well into 2030). And it certainly does not want any actual cut in the face value of the debt outstanding (a write-off), which it sees as setting a precedent that future debtors can get away without paying eventually. The reality is that with the Greek economy unlikely to grow at more than 2% a year after inflation for the foreseeable future and the burden of financing the debt standing at 15% of GDP each year and rising, there is no way that Greek capitalism can escape of the spectre of the debtors prison. At the end of 2015, 75% of Greek public debt was in the form of official loans. Bond holdings of European central banks amounted to an additional 6%, while some additional percentage was held by (largely state-owned) Greek banks. Even if Greece reaches an overall budget balance this year, new borrowing will be needed in the future. The current €16bn loan from the IMF needs to be repaid by 2021, and the €20bn bond holdings of the ECB and national central banks by 2026. The current stock of €3bn pre-2012 bonds, which were not restructured in 2012, also needs to be repaid. Repayment of the remaining €31bn bonds which resulted from the 2012 debt restructuring will start in 2023. The €53bn bilateral loans from euro-area partners granted in the first financial assistance programme will have to be repaid between 2020-2041, according to current schedule. As the economists group put it starkly: “To achieve debt sustainability without face-value debt relief, ….would imply a large increase in the total exposure to Greece of the European official sector from currently expected end-2018 levels, that is, by 50% or more. It would also mean that Greece could still be paying off debts to European official creditors well into the 22nd century.”! As the economy crawls along the bottom, the Syriza government can offer no relief to its voters from the grinding poverty and tax burdens they now suffer. Indeed, on 1 January 2019, pensions, already cut heavily, face another cut of up to 18%. The government calls for debt relief from the Troika but what is really needed is debt cancellation; proper taxation of the very rich who continue to avoid any severe measures; the public ownership of the banks and big businesses that rule Greek investment and a state plan for investment. It was what was needed at the time of 2015 referendum when the Greek people voted down the Troika measures. Three years later, nothing has really changed and, as a result, in the next election, voter turnout will plummet and Syriza is likely to lose and be replaced by a right-wing coalition. The spectre of debt will remain. This entry was posted on May 22, 2018 at 6:39 pm and is filed under capitalism, economics, Profitability. You can follow any responses to this entry through the RSS 2.0 feed. You can leave a response, or trackback from your own site. Greece is a very sobering moment for those who thought that all you had to do was elect a left enough government and that would be sufficient. Syriza’s betrayal doesn’t bode well for a Corbyn or Sanders government. So the practical conclusion is that there is no solution that does not begin with repudiating the debt, right? Why not say that directly? No, not solely to bail out banks; and not solely German Banks. Credit Agricole, Barclay’s RBS, Dexia, all booked serious losses on holdings of Greece’s sovereign debt. These banks and other private creditors were forced to take a haircut on their holdings of up to 50% in 2011. The private creditors are now pretty much out of the picture, except for those “contrarians” and funds that deal in distressed debt; and nobody’s looking to bail them out. The big issue with debt relief is that the central banks of the EU are the holders of the debt. Greece was destroyed not so much to bail out banks, including Deutsche Bank, but to preserve capitalism and the authority of the ruling class. Well, I’m not so sure of your conclusion Michael. Something has changed even though you are correct about the non-sustainability of Greek debt and the need of its cancellation. I mean the economy is recovering by investment and export growth, unemployment rate has fallen from 26.5% in 2014 to 20.8% today and all confidence indicators show essential improvement after international rating agencies have upgrated Greece and all signs converge to the country’s successful exit from the Program. Moreover, some type of debt relief has been already agreed by European creditors. Having heard today’s political debate in the parliament I think SYRIZA government still leads politically and may change polls forecasting in the coming months, unless unexpected events happen. yes it is possible that Syriza will survive, but the economic recovery remains very modest indeed. A lot has changed. They privatised regional airports, the trains, now the main electricity company. Most new jobs are part time paid on full time contracts. Tgey have introduced socual welfare payments to 700k citizens. They are also housing and feeding multitudes that they label…. refugees. But at least they kept the Euro. I contact you on behalf Kordatos again. We would like with your permission to translate and re-post your “Greece: the spectre of debt” article; with due mention on the source and its author of course.